The properties of epoxy binders used for production of polymer composite materials are given. The differences between the binders of melt and solution type are demonstrated. 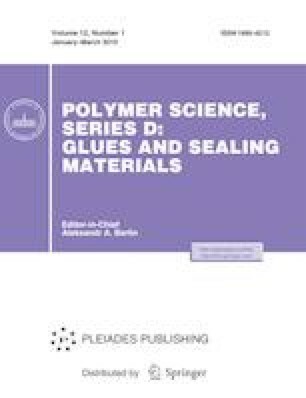 The influence of the filler type on the structure and water resistance of the cured binder in the polymer composite material is considered. The temperature range of the binder processing is found. This work was carried out as part of the implementation of the integrated research field 13.1 Binders for Polymer Composite Materials of Structural and Special Purpose (Strategic Directions for the Development of Materials and Technologies for Their Processing for the Period up to 2030 [1–3]).